You don’t have to listen to anything I say because I am powerless….Although I am the Commissioner (look it up on the official Derby name register), all it means is I get to rant and suggest and I don’t have to worry about what anyone thinks. Assassination City Roller Derby. Photo by channelinspire.com. If some of you can take criticism (oh what a way to start! ), I would like to talk about Derby presentation today. I know that I have mentioned before about making your games into events. Yes you have to be concerned about the skaters; without them there is nothing. But if you want to grow and expand your audience, concentrate also on the spectators. I got the feeling at Rollercon that many leagues do not really have a plan in how to promote your events and how to maximize your presentation. I am not talking merely about the production. If you don’t figure ways to promote, people except for friends and family will not come. And if they walk into your venue and they don’t get a little bit excited you are already in trouble. Is the front of your arena clean and fan friendly…..do you have well-appointed members of your league there to greet them; give them programs, tell them where the vendors are, and more? And when they go into the rink area is it well lighted enough so they will focus on the game and not be easily distracted. Are there decorations or other types of banners to enhance the setting. And I would love to see the minor penalties go away so there are no excess people standing in the infield. And the warmups: are they disciplined and exciting…..at the end do all the skaters get in a line and do a fast powerful pace for a few minutes to show the teamwork and skill? And I am certain there are other things you can think of…..Are your announcers in sync with what you want to present? so important….and how good is your demo of the game? Roller Derby now has over 1000 leagues worldwide and the attention on your league will only increase because of the growing interest. 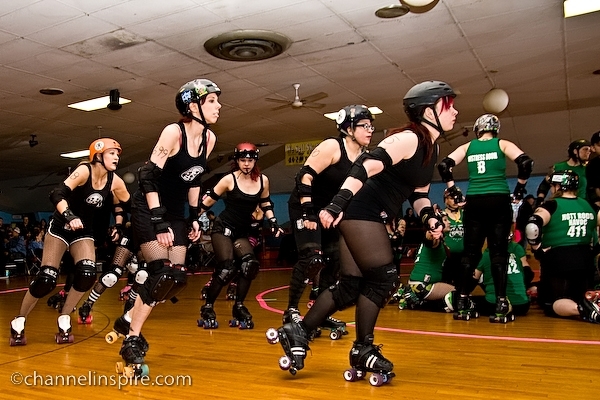 Now here is the part that just pushes everything to a higher level as far as I am concerned, and it was so important to me and Roller Derby of my day…..what are the skaters wearing and how do they present themselves. OK right away I expect to hear ” it is our game, we put our numbers on our sleeves, wear tattered hose etc”….I understand and those that feel that way will continue to do so. But to look at what you need to in order to move to the next level; your uniforms and gear must be of the highest order and signify sleekness, power and speed. They should have numbers on them, not added, your league’s name and logo on them all part of the original design. The leagues that are doing this are setting themselves off from the street-skating look. I will continue this discussion with some suggestions that I have for you. Stay tuned or just throw a skate at me. Derby Love, Your powerless Commissioner. AMEN Jerry. A-freakin’-men. As a member of our event coordination committee, I have bled to make sure that our bouts are put on like big time events. Our league goes so far as to abstain from doing themed bouts and giving each bout a cute name (a blog post I wrote about this was met with some passionate responses from the derby community http://30pointjam.wordpress.com/2010/12/07/bout-themes-are-stupid/). If you’re going to expect fans to spend their $10+ at your bout, you better give them a SHOW. Not just skaters in cute outfits or even high quality skating. Everything needs to be top notch. Your venue must look good, your announcers must be engaging and you must keep the fans excited for the whole bout. Thank you for shining this light on bout presentation. It’s this aspect that can really take derby from being a good spectator sport to a great one. let no one interpret that by show ExploSean means contrived skating in any form…..Look at what the NBA does with video, mascots, etc…..and how about shortening the halftime to 15 minutes! Way too long between halves, fans drift away. and don’t tell me it is to get the officials together….get rid of the minors and the long time outs and dragging plays will end. Explo does an amazing job. He really does. I often look at suggestions on how to make events more like…events, and think “well, we already DO that”. It would be great if Explo could help lay out some suggestions for leagues…..it is time we get beyond the initial stages of renting a venue and that is that. And I agree about the numbers on the uniforms: newbs and fans alike need to see who’s doing what, and it’s one thing for friends and family to know who’s skating and how they move, but hopefully they’re not the only audience! My league has its skaters wearing team shirts which are all uniform; what they do with the rest of their appearance is up to them (provided it’s safe and they wear their safety gear) which is a nice mix between the “alternative” thing and the “professional athlete” thing… it works nicely, IMHO.